Pirate-themed heavy metal is a difficult style to categorize. One one hand, the use of accordions, tin whistles, and 18th-century melodies could (and does) lead to bands like Scotland's Alestorm being classified as folk metal. On the other, can an occupation be considered "folk" in the same way that ethnic cultures, such as Irish or Scandinavian, are? It's a grey area, I suppose, and one that these four lads from Perth have been exploiting to their advantage for more than half a decade now. 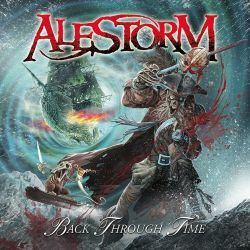 Back Through Time, Alestorm's third full-length album of tales about drunken rabble-rousing, lustful wenching, and all-around nautical skullduggery, is very much an enjoyable listen specifically targeted to metal fans who enjoy a good keelhaul now and again. Alestorm has always been about propagating the "Pirates of the Caribbean" image through their highly contagious style of power metal, and Back Through Time continues that trend without much deviation. The band's liberal use of accordion-accompanied power metal riffs and flagon-raising gang choruses truly imparts a sense of high seas adventure, with "Shipwrecked" being one of the tracks that best exemplifies Alestorm's style - and, as an added bonus, there's a nice accordion/bass duet to boot. "The Sunk'n Norwegian" features a fantastic use of the tin whistle, along with some seriously meaty riffs from Dani Evans, and as such is another standout track. Frontman Christopher Bowes has a gruff vocal style that is more than a perfect fit for Alestorm's image, making it easy to envision him as a gnarled old salt. His delivery actually bears a lot of similarities to that of Rolf Kasparek of that other pirate-themed heavy metal powerhouse, Running Wild, though Bowes definitely comes across as the more enthusiastic singer. There's little variation in Bowes' style during the course of Back Through Time, that is until the final, theatrically epic track "Death Throes Of The Terrorsquid". Here he briefly delves into a raspy black metal style to go along with the blast beats from newcomer Peter Alcorn and some tremolo riffing from Evans. Could this be a hint as to the future direction that Alestorm looks to take? Back Through Time opens with a title track (featuring the piratical voice of Lord Jaldaboath himself) that also contains some furious riffing and blast beats, so there may be more brutality in store from the band. "Scraping The Barrel", with its swaying riffs, is a humorously self-examining drinking tune that reflects on just how far a band can ride the wave of pirate metal, so maybe there's a change looming just beyond the horizon. From start to finish, Back Through Time is a fun album. Just about every track is a highlight, though a couple of them ("Midget Saw" and "Swashbuckled") are just so-so. But with songs like "Rum", a raucous tribute to the Caribbean's tasty potent potable that comes complete with shouts of "Ahoy! ", the album remains strong and is recommended for any fan of gritty power metal who has an affinity for occasional booty plundering (and really, who doesn't? ).